Printing technology has changed drastically. Many of us are familiar with printers giving black/color prints. However, many professionals and businesses are using 3D printing solutions for their businesses. Have you heard about 3D printing? What is it? 3D printing refers to printing a 3D object. 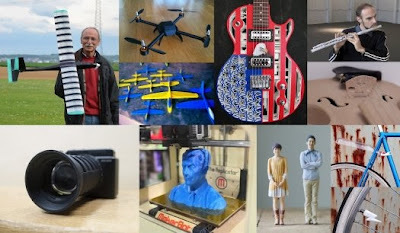 Yes, 3D printers can create 3D objects according to digital 3D image files. It is interesting to know the history of 3D printing technology. Just go ahead and reveal it. Charles Hull in the year 1984 developed a technology of printing 3D objects from a digital data. Later in the year 1993, 3 dimensional printing technology was introduced which was similar to inkjet technology used in 2D printers. In the years 2005 and 2006 high definition 3D colour printers were introduced in the market. 3D (3 Dimensional) printing, which is also called as additive manufacturing is the revolutionary method of creating 3 dimensional models by adding successive layers of material using a technology similar to inkjet. This amazing technology saves time and cost which is required for traditional methods of prototyping. The object for which a 3D prototype is to be created is either scanned with a special type of scanner or a soft copy of its design is made available in the computer. A 3D printer is then connected to this computer. The 3D printer gets the input from this digital data and starts making a 3D prototype by laying down the layers of resin or extruded plastic in the exact shape of the object. These laid layers get dry immediately giving a solid surface to the prototype. This process continues till the complete 3D image of the object is created. Even it is used in jewelry and footwear industries. The advanced technology of 3D printing will soon leave the era of printing with spraying toners, far behind. 3Digi Prints is India’s first 3D printing service provider with high end 3D printers and printing services. For more details, visit 3digiprints.com.